Are You Creating Relationships Now that Drive Enrollments Later? You know it when you feel it. It’s that single point in time, or that span of time, when you realize you’ve transitioned from the transactional to the emotional. You have a sense – often hard to describe – that your interaction with someone, some thing, some organization, or some brand has become more important, meaningful, and lasting. Congratulations! You are in a relationship. College and university admission professionals often ask: Do relationships drive college choice? And, how can we influence the bonding process? 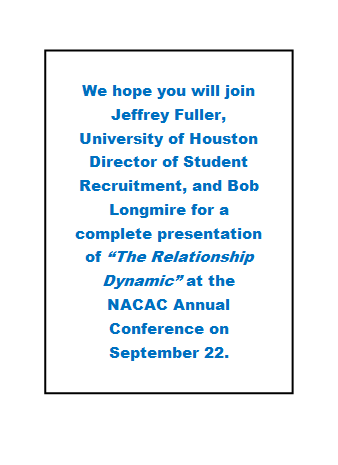 Our recently released co-sponsored study, “The Relationship Dynamic,” set out to get the answer to those questions. We asked over 12,000 college-bound students if and how they formed connections and bonds with the colleges they considered attending. What they told us just may change the way you recruit prospective students. 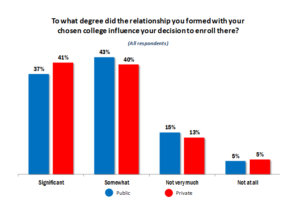 The overwhelming majority, 8 in 10 students, say the relationship they formed with their chosen college was influential in their decision to enroll. Nearly half of this group says it was “significant” in their decision. When asked to rate the strength of the relationship they formed with their chosen college (on a 10 high scale) leading up to their final decision 45% rated it 8 or higher. Two-thirds of students in this study applied to four or more colleges. Almost 11% applied to more than 10! Over 80% visited multiple college campuses. Yet, with all of that activity the majority of students developed relationships with just two or three colleges. Students can clearly recall the circumstances and interactions that led to their feeling of having formed a relationship with their chosen college. “The first time I met my admissions counselor,” several students responded. The separation between the chosen college and the second choice is wide with regard to six key factors that influence relationship building. For example, 61% of students indicated that the statement, “Admission reps were sincere and cared” applied to their chosen college but only 25% said it applied to their second choice college. With reference to the statement, “The college understood me” 59% said it applied to their first choice school vs. 22% to their second choice. Interested in knowing what your prospective students are thinking? Consider jumping on board our recently launched “Hidden Influences: Revealing the unspoken perceptions that prospective students have about your college and why it matters in your ability to grow and control enrollment.” Co-sponsoring institutions receive a wealth of data and information specific to their college to help plan and execute a more effective enrollment and recruiting plan. They also receive a comprehensive set of tabulations relating to their pool of students, as well comparative data of others in their cohort and other market segments. “Hidden Influences” is going to dive deeply into uncovering the things students hold back from colleges during the college shopping process and, more importantly, the findings will provide colleges with strategies and methods to uncover hidden influences and deal with them before the student solidifies his or her enrollment decision. 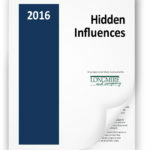 Getting involved in the “Hidden Influences” study is easy, low-cost, and provides valuable deliverables. There is still time for you to get on board and be among a growing list of public and private colleges nationwide that will benefit from this information. I encourage you to download a PDF that will give you all the information you need. For more information or to reserve your participation in this study, contact me at 913) 492-1265, ext. 708 or by email at rmontgomery@longmire-co.com or Bob Longmire at (913) 492-1265, ext. 709, blongmire@longmire-co.com. Colleges are signing up now so we encourage you to contact us soon to confirm your participation. CLICK HERE FOR COMPLETE INFORMATION.